Super Slow® is a one-on-one, high intensity, low force strength training method that is performed approximately twenty minutes, once or twice per week. The method was created by Ken Hutchins in 1982 during a Nautilus Sports Medical Industries sponsored osteoporosis research project at the University of Florida Medical School. Super Slow®® exercise is conducted in a clinically controlled environment that is free of distractions (i.e., music, mirrors, plants, etc.). 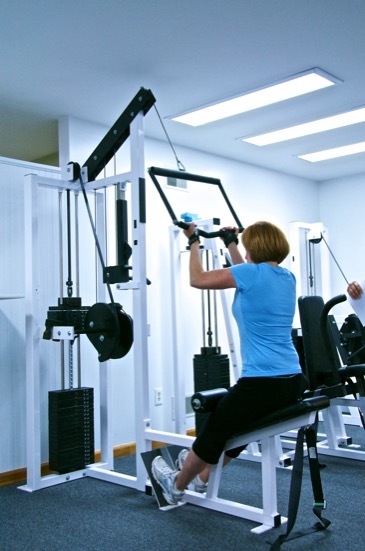 All training is provided privately under the continuous supervision of a certified SS instructor on state of the art exercise equipment designed specifically for use in the SS protocol. The workout itself involves performing both positive and negative aspects of each repetition in approximately 10 seconds, eliminating acceleration and momentum (the cause of most strength training injuries). This constant loading of the targeted musculature causes muscle failure to occur quickly and safely, triggering the desired adaptive response.